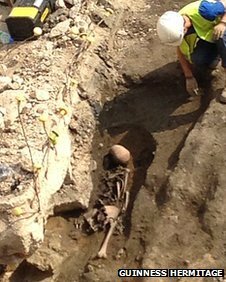 ROYAUME UNI – Gloucester - About 40 skeletons have been uncovered by archaeologists at the site of a Roman cemetery in Gloucester. The discovery was made during a dig at the former Gloscat site at Greyfriars in Brunswick Road, ahead of a housing development being built. Stuart Joyce from Cotswold Archaeology said: "We're just outside the walls of the Roman city of Glevum and this would have been the Roman cemetery associated with the city. Forty skeletons were uncovered nearby in the 1960s. These are now kept at Exeter University. "The cemetery itself was known previously, but this is the first time that such an [archaeological dig] in this area has been conducted under modern excavation practice," added Mr Joyce. "Maybe another 20 to 30 will come up during subsequent excavations, but the number is very hard to say." Excavation work on the site is expected to last for at least another two years while a new housing development is built. 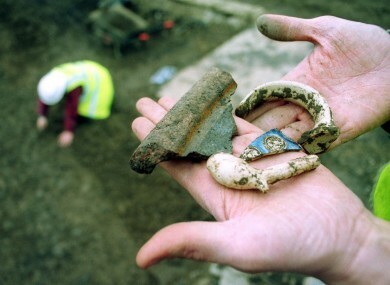 ROYAUME UNI - Flodden - Archaeologists are to recreate the Battle of Flodden in a bid to discover what caused the massacre of thousands of Scots pikemen. Dr Tony Pollard, of Glasgow University, will carry out the experiment during a weekend to commemorate the 500th anniversary of the battle in which King James IV of Scotland died. Weapon-making techniques abandoned 400 years ago have been brought back especially in order to recreate scenes from the battle during the event at Etal, near Flodden in North Northumberland on Saturday and Sunday. "I am very excited about this as no-one has ever tried it before," Dr Pollard, director of the Centre for Battlefield Archaeology, said. "It just struck me that we would have these re-enactors and weapons here at this special event so let's use them. "We will take the pikemen who are here to perform battle re-enactments and replicate their advance down Branxton Hill. "The idea was that they would move in impenetrable blocks of thousands of men. 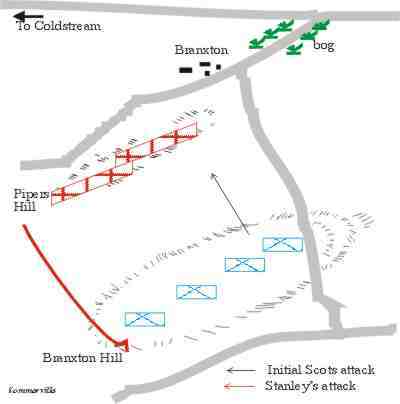 "However, the historical accounts suggest that the steep slope made cohesion impossible so the English, who were waiting at the bottom, were able to parry the pikes out of the way with their shorter weapons, called bills, and hack the Scots to pieces." USA – Montpelier - The latest discoveries serve as the capstone to excavations and ongoing interpretation funded by a four-year Collaborative Research Grant from the National Endowment for the Humanities. The initiative is providing a better understanding of slave life in the early 19th-century Virginia Piedmont region and places Montpelier’s enslaved community into the larger Atlantic history of the African Diaspora, in comparison with other sites in the Chesapeake and Caribbean. Excavations took place at four venues across the plantation: the Stable Quarter (homes for enslaved livestock handlers, excavated in 2010), the South Yard (homes for house slaves, excavated in 2011), the Tobacco Barn Quarter (homes for enslaved field laborers, excavated in 2012), and the Field Quarter (homes for enslaved field laborers, excavated in 2013). The four residential locations provide a unique opportunity to compare and contrast the conditions of chattel slavery of the period. Differences and similarities between these locations “particularly architectural styles and household goods such as ceramics, glassware, and clothing items” reflect the relationship of individual households to each other, the community to which they belong, their relationship to the overarching plantation complex, and regional patterns of both market access and cultural traditions. Deposits from these sites date to Madison’s retirement years, from the late 1810s through the 1830s. MEXIQUE – Chichen Itza - New observations confirm that the main pyramid in the ancient Mayan city of Chichen Itza, located in Mexico’s southeastern Yucatan state, was built to serve as an astronomical marker for making adjustments to the calendar, the National Anthropology and History Institute, or INAH, said. Archaeologist Ismael Arturo Montero Garcia revealed in 2012 that the movement of the Sun over the structure occurs on May 23 and July 19, appearing at dawn on the axis of the northeast corner of the Templo de las Mesas, the INAH said in a statement. 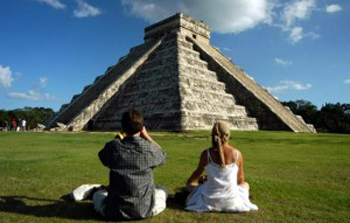 Last Friday, when the phenomenon occurred once again, Montero returned to calculate the alignment of the west stairs of the pyramid known as El Castillo, obtaining a figure that is outstanding from the standpoint of sacred astronomy, the INAH said. The pyramid “points to the path with only one degree of deviation with regard to the entrance to the Holtun sinkhole, a site for offerings that is under study,” Montero said. “What we have here is an astronomical observatory of notable precision in a natural environment,” Montero said. IRLANDE – Unauthorised metal detector users are being warned by Government to avoid archaeological sites as new guidelines are published on the use of metal detection devices. The Minister for Arts, Heritage and the Gaeltacht, Jimmy Deenihan has said that the new guidelines have been published as a result of evidence of “illegal treasure-hunting and export and sale of unlawfully retrieved archaeological objects”. As a general rule the guidelines set out that it is against the law to engage in general searches for archaeological objects in Ireland using a metal detector unless you have received written consent from the Minister.